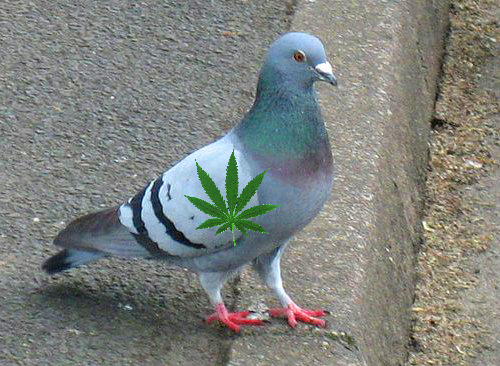 Call it a case of high-flying criminal ingenuity: Colombia police captured a carrier pigeon trying to fly into a Bucarmanga jail with marijuana and cocaine paste strapped to its back, the BBC isreporting. Officers say they recovered the bird about 1 block away from the prison. Carrying a package with 40 grams of marijuana and 5 grams of a paste containing cocaine, the bird -- which police believe had been trained by inmates or accomplices -- appeared to be unable to successfully clear the prison walls. "We found the bird about a block away from the prison trying to fly over with a package, but due to the excess weight it could not accomplish its mission," said Jose Angel Mendoza, the local police commander, told the Telegraph. The bird is reportedly now being cared for by the local ecological police unit. This is not the first time birds have been used by prisoners for smuggling or drug-related purposes. Local police say previous pigeons had been used to smuggle Sim cards for cell phones into the same jail. And last year, a parrot named Lorenzo was "arrested" after being found to be tipping off traffickers at a drug warehouse in Barranquilla.